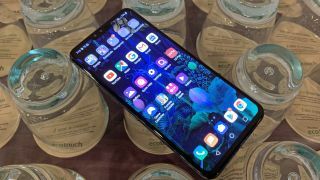 LG showed off the new, 5G-capable V50 ThinQ this year at MWC 2019, but there was no word on the price or release date at the time. Now, the LG V50 has release date and price in Korea, as LG press has announced. The confirmed price for the LG V50 is 1,199,000 Won, which is approximately $1,060 (£805, AU$1,485). The release date is April 19, and customers can get LG's Dual-Screen accessory for free with their purchase until May. The price of the LG V50 shouldn't be too surprising. The earlier LG V40 cost $900 (around £690 / AU$1260) at launch, and the LG V50 is an undeniable upgrade. The LG V50's Snapdragon 855 chipset promises to offer fast speeds inside the device, coupled with a 5G modem for faster connectivity to outside carriers. Beyond the brains, it has a 6.4-inch OLED display, three-camera system on the rear, dual-camera system on the front, an IP68 rating against dust and water, and military-grade drop protection. As painful as a over-$1,000 price tag can be, it's not surprising to see from a new flagship in the past year, especially when factoring in the extra cost for early adoption of 5G. However, the price for the LG V50 is still sitting below the Korean price of the Samsung Galaxy S10 5G. While the news of Korean prices and release dates for each phone do give us some insights into the ballpark of when they may release elsewhere and for how much, the only thing that's really clear right now is that neither will come cheap.